The Showpark Summer Classic’s highlight jumper event kept viewers on their toes as only three of 30 starting entries competed in the jump-off. Richard Spooner and Chatinus, whom he co-owns with Tracy Katayama Esse, ultimately emerged on top in the $50,000 Grand Prix of Showpark after executing the fastest of the three double-clear rounds. Riding for Neil Jones Equestrian, Inc., Mavis Spencer piloted Chacco to a second place finish just over half of a second behind Spooner, and Keri Potter rode Julia Koetting’s Bitalica to third. International course designer Anthony D’Ambrosio of Red Hook, NY built the stout 1.50-meter grand prix course; it featured double and triple combinations, several technical bending lines, and multiple options for striding. For much of the class, Potter stood as the only clear, but then Spooner and Spencer, who were two of the last three to compete, were fault-free and the pressure was on. Second to jump off, Spooner, the “Master of Faster,” stopped the clock in 38.37 seconds. Chatinus is a new addition to Spooner’s string — —the two teamed up just this summer. 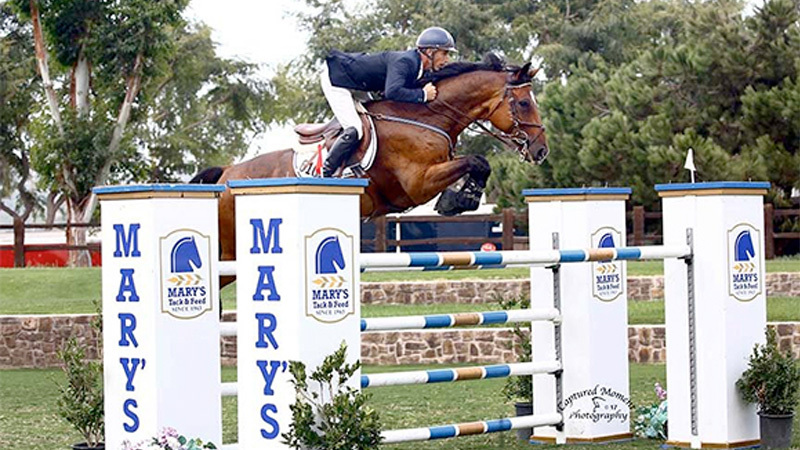 The 10-year-old gelding had previously competed up to the 1.50-meter level in Europe with German riders Timo Beck and had been developed in his early years by fellow German David Will. Spooner has had the ride just a few months.